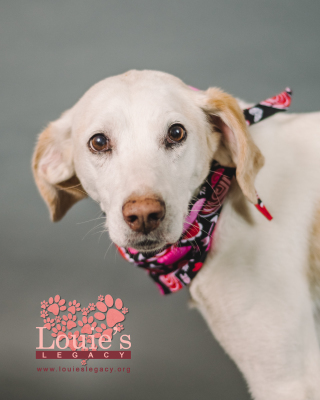 Arrow is an English Pointer mix who is about 6-7 years old. When he is all wound up, he likes to run and jump around on his long legs like a clumsy puppy. He loves his time in the fenced yard, where he can putter about and investigate every corner. When he catches the scent of a squirrel or rabbit, he barks excitedly while tracking with his nose to the ground. He likes to stay outside, but the treat bag helps convince him that the inside is fun too! He gets along well with most dogs, but he prefers the more easy-going type, with gentle play. In the evening, its time to snuggle up close for scratches, and he will fluff up all the blankies to make it just right. He thinks all furry, squeaky toys are fabulous, but is partial to really bright colors. If you don't want to play, he will toss it around and entertain himself. He came to us very thin, but his foster mom has been helping him get back to a healthy weight. At night and when no one is home, he stays in his Cargo crate in the room with the other pups. He will protest for a few minutes, but then remembers how much he likes a good nap and dozes off. Arrow has only been on a few walks but is pretty good on the leash. Sometimes he will cross in front of you, so you have to stay on target, but he should be fine with some practice. Arrow is a bit stubborn, just as you might expect a Hound to be, but he is mostly an easy-going pup that enjoys his human companion.